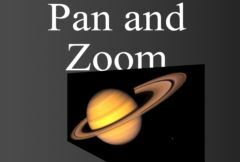 Loads a still image from a file and pans, zooms, or rotates it in three dimensions, while preserving the original resolution. To get started, click the Load File button and choose an image. Supported formats include JPEG, PNG, TIFF, and EXR. Then adjust the parameters such as Shift, Zoom, and Rotate to position the image, and set keyframes to create movement. Background: The current track. The clip to use as background. The output of the effect is composited over this clip. Loads an image file. This file will be read from its original location each time your project is opened or rendered. If you move the file, or move your project to a different machine, the file will have to be re-loaded before it can be rendered. Zoom: Default: 1, Range: 0.01 or greater. Zooms in or out on the image. Values less than 1.0 move it farther away and make it smaller. Values greater than 1.0 move the image closer and enlarge it. This parameter can be adjusted using the Shift Widget. Scale: X & Y, Default: [1 1], Range: any. Adjusts the horizontal and vertical scale of the image independently. Use this to stretch the image or change its aspect ratio. This parameter can be adjusted using the Shift Widget. Rotates the source image by the specified angle in counter-clockwise degrees. Translates the source image. This parameter can be adjusted using the Shift Widget. Swivel: Default: 0, Range: any. Rotates the image left or right in 3D about the vertical axis. Tilt: Default: 0, Range: any. Rotates the image up or down in 3D about the horizontal axis. You can use Swivel and Tilt together to rotate about arbitrary diagonal axes. Controls the amount of lens telescoping while applying Swivel and Tilt. Increase for more 3D perspective. Shear: X & Y, Default: [0 0], Range: any. Shears the source image horizontally or vertically. Combine: Popup menu, Default: Foreground Only . Determines how the image is combined with the background. Over: The image is composited over the background. Foreground Only: The background is ignored and only the image is shown. Crop Left: Default: 0, Range: 0 to 100. Crops the left side of the input image. Crop Right: Default: 100, Range: 0 to 100. Crops the right side of the input image. Crop Top: Default: 0, Range: 0 to 100. Crops the top of the input image. Crop Bottom: Default: 100, Range: 0 to 100. Crops the bottom of the input image. Distance from the center where the vignetting starts. Vignette Center: X & Y, Default: [0 0], Range: any. Adjusts the center of the vignette ellipse. Vignette Rel Height: Default: 1, Range: 0.1 or greater. Controls the aspect ratio of the vignette ellipse. Shadow Opacity: Default: 0, Range: 0 or greater. The opacity of the drop shadow. Use values near 0 for subtle transparent shadows, or values near 1.0 for stronger shadows. Shadow Shift: X & Y, Default: screen lower right. Blur Shadow: Default: 0.1, Range: 0 or greater. See general info for: Motion Blur , Resolution , Clamp Output To Legal , Bypass Effect , and Reset .